It refers to the discomfort in the upper abdomen often caused by eating too much, eating too quickly or eating very spicy foods. 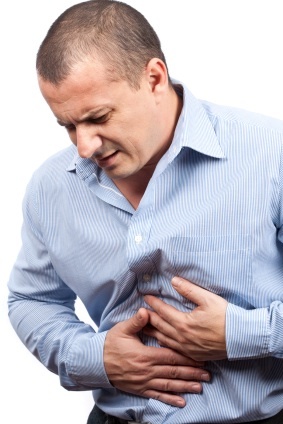 Indigestion can be caused by a wide variety of factors which include stress, anxiety, excessive smoking, excessive alcohol consumption, being overweight or obese, consuming excess caffeine, being pregnant etc. Ginger – Crush fresh root ginger to extract the juice. Mix the juice with lemon juice and add a pinch of salt to it. Mix thoroughly and add some water to make up the drink. Peppermint Tea – Drink an infusion of peppermint tea after meals to reduce the feeling of fullness. It has digestive, carminative and antispasmodic properties and has traditionally been used for indigestion, colic, wind, nausea, and vomiting. Pineapple – Eat a slice of fresh pineapple after meals to ease symptoms. Pineapple contains an enzyme called bromelain, which breaks down food and aids digestion. Fennel Tea – Drinking an infusion of fennel tea can help ease trapped wind. It is an antispasmodic and carminative which has been widely used for colic, wind, and irritable bowel. It can be added to milk formulas to ease griping in infants. Honey & Vinegar – Drink a little warmed apple cider vinegar and honey in a cup of hot water to ease indigestion. We recommend Braggs brand of apple cider vinegar.